Larry Krystkowiak asks his sons if they want the perspective of a coach or a dad. (Francisco Kjolseth | The Salt Lake Tribune) Luc, left, and Ben Krystkowiak, sons of Ute coach Larry K., are varsity basketball players for Brighton. Having heard the usual taunts and chants all night, Brighton High School sophomore Ben Krystkowiak sneered at the Timpview student section as he ran down the court after making a 3-pointer. He’s saying that as both a coach and father, lines that occasionally become blurred. Utah’s program has five sons playing for prep and college teams. The list includes Krystkowiak’s three sons; former Ute guard Jake Connor, who’s finishing his career at nearby Westminster College as a graduate transfer; and future Ute guard Rylan Jones, who hopes to conclude his Olympus High tenure with another state championship in March. Jake Connor • 6-5 senior guard, averaging 10.3 points and 2.1 rebounds for Westminster College. Rylan Jones • 6-1 senior guard, averaging 20.3 points, 7.8 rebounds, 7.6 assists and 3.1 steals for Olympus High. Ben Krystkowiak • 6-2 sophomore guard, averaging 7.7 points and 1.7 rebounds for Brighton High. Cam Krystkowiak • 6-10 post-graduate forward, averaging 10.5 points and 6.5 rebounds for Northfield Mount Hermon School. Luc Krystkowiak • 6-5 senior forward, averaging 17..4 points and 7.0 rebounds for Brighton High. Krystkowiak's three sons all spent time together on the court for Brighton last season, with Cam as a senior and Ben as a freshman. Cam, a 6-foot-10 forward is enrolled at Northfield Mount Hermon School in Massachusetts, and is being recruited by Ivy League schools. Luc is a 6-5 senior forward and Ben is a 6-2 guard, each starting for Brighton. “When he's talking to me after a game, I don't know if he's talking as a coach or to be my dad, but you take things from it and you learn, obviously,” Ben said. Krystkowiak will be coaching Chris Jones' son next season. Rylan Jones' arrival as a scholarship player also will create a new dynamic in a relationship where the father personally coached his son's summer teams in Logan for seven years and guided his career. In November, two days before Rylan signed with Utah, Chris Jones sat on the bench before a game at Minnesota and wondered what next season would be like, with his son in that environment. He later learned that Rylan was having similar thoughts at that moment. “I'm sure at the end of it all, it's be a real positive thing and it'll be fun just to be around him every day and watch him practice and watch him get better,” Chris Jones said. (Leah Hogsten | The Salt Lake Tribune) Olympus' Rylan Jones (15) is pressured by Corner Canyon's defense. 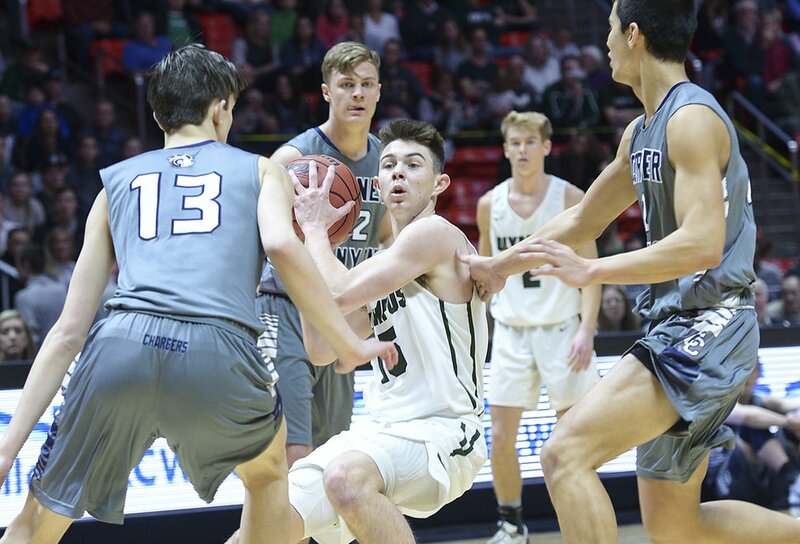 Olympus plays Corner Canyon for the 5A High School BoysÕ Basketball Tournament Championship at the Jon M. Huntsman Center in Salt Lake City, Friday, March 2, 2018. That was the Connors' experience, although Jake's case was different, as a walk-on who appeared in 36 games over three seasons. 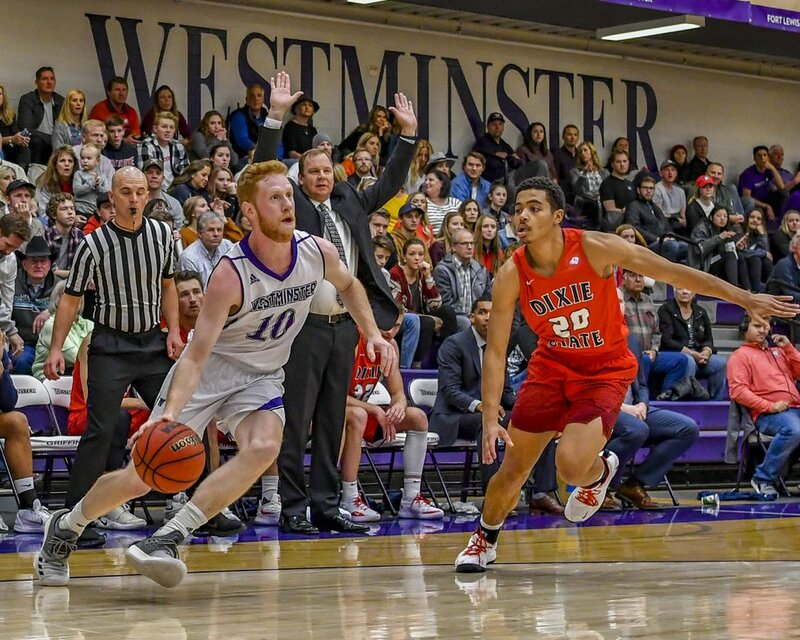 He graduated from Utah last spring and transferred to Westminster, where his father once relaunched the school's basketball program. (Photo courtesy of Westminster College). Westminster College guard Jake Connor, formerly of Utah, drives against Dixie State. He’ll always remember the NCAA Tournament’s Sweet 16, a European tour and trips to Hawaii and New York. And he’s at Westminster, in a modern facility near the old Payne Gym, where he spent much of his childhood. Connor lives with Utah players Beau Rydalch and Novak Topalovic and two Ute student managers, while working toward a master’s degree in community leadership. “Being able to watch him evolve over four years and mature and get better, then now go watch him when he's playing a lot, it's really fun,” Tommy Connor said. The coach knows he's being watched, as he watches. Luc emphatically blocked a shot and Jan Krystkowiak naturally did what any mother would do, jumping and raising her arms. Her husband resembled an Irish dancer, clenching his fists and keeping his arms at his sides. As the game wound down, Ben stayed on the bench. The Bengals trailed by a point in the last 20 seconds, when Wilson called a post-up play for Luc. He missed a shot in the lane and no foul was called, as his father stared straight ahead. A disappointing finish seemed likely for the family, even after Luc's 22-point game. During a timeout, Larry Krystkowiak moved from his seat and stood against the wall behind the basket. After a Jordan player hit one free throw but missed the second attempt, Brighton’s Adam Templeton made his only basket of the game — a buzzer-beating 3-pointer. The Bengals swarmed the court. Krystkowiak grinned. At Haas Pavilion, Berkeley, Calif.
Records: Utah 10-8 (4-2 Pac-12); California 5-14 (0-7 Pac-12). Last meeting: Utah 77, California 43 (2018). About the Utes: Utah has won three straight games for the first time this season, beating three teams (Washington State, Colorado and Stanford) in the bottom tier of the Pac-12. Now comes Cal, winless in conference play, with this fact that should get the Utes' attention: Twice in this decade, a team has gone 1-17 in the league, beating only Utah. … The Utes are in a three-way tie for fourth place in the Pac-12, a half-game out of second place. … Previously published schedules showed a later tipoff; the game was moved up for ESPNU’s purposes. About the Bears: Cal has not won a Pac-12 game since Feb. 3, 2018. … The Bears lost 68-59 to Colorado on Thursday, but they showed some determination in rallying from 18 points down early in the second half, briefly taking the lead. … Cal has four double-figures scorers, led by Justice Sueing (14.1). … The Bears are 5-5 in Berkeley, where the Utes have lost on their last two visits – most recently in 2017. … This is the teams' only meeting this season.